When our daughter was 6 months old, we flew to Costa Rica. I was still nursing, but didn’t want to have an infant attached to my body the entire trip, so I decided to travel with breastmilk that I had previously pumped. This was my first experience flying with breastmilk. Since then, I have done so several times, and have brought liquid formula as well as baby food on the planes without any issues. Although, TSA has a limit on the amount of liquids you can bring on a plane, those rules do not apply to breastmilk, liquid formula, or baby food. You can actually bring large quantities of these liquids through TSA. But there are a few things to keep in mind that will make the process easier. If you plan to travel with breastmilk or formula, keep it in its own small bag rather than placing it in your carry-on luggage. (You are allowed to bring a separate bag for breastmilk or formula in addition to your carry-on bag and personal item. Keeping the liquids separate makes it easier for screening purposes. 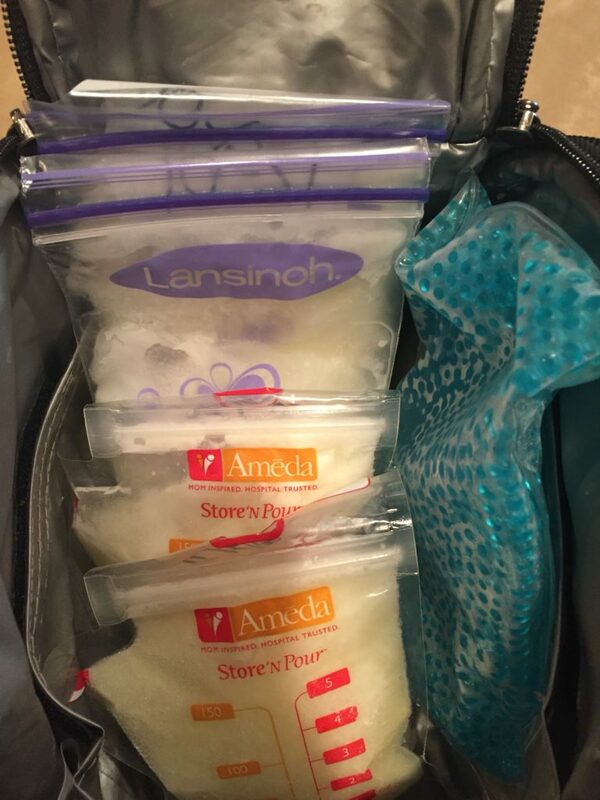 The picture below is the bag I use and how I pack it when flying with breastmilk. It is an insulated bag so it stays cooler longer. When you arrive at the security checkpoint, tell the TSA agent you are flying with breastmilk or formula and put the bag on the conveyor belt for inspection. It will need to be sent through the X-ray machine. Don’t worry, the X-ray machine does not harm the breastmilk. If you do not want it to go through the X-ray machine, you will need to inform the agent. In that case, your milk or formula will likely be opened and have to go through additional testing. You can also bring gel cooling packs through TSA to keep your breastmilk or formula cool or frozen. If you plan to fly with frozen milk, be aware once it thaws completely you must use it within 24 hours, so I would not recommend bringing too many bags of frozen milk on a long flight. Consider giving your baby milk from your frozen stash in the days leading up to your trip and pump when you would typically feed your little one. TSA will inspect, and even open your breastmilk to run tests on it. The process doesn’t take long and doesn’t taint the milk. Planning to formula feed while traveling? Read this post first! 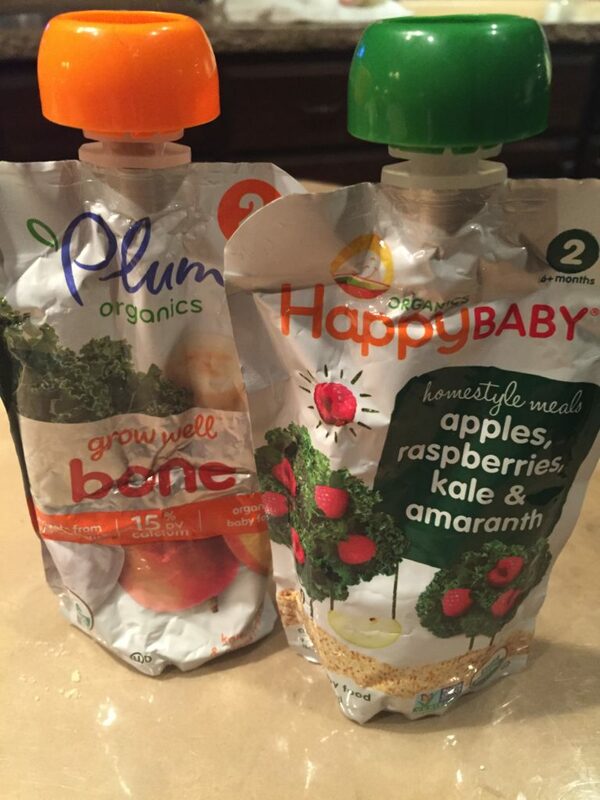 Traveling with baby food falls under the same category as traveling with breastmilk or formula, with a few exceptions. You are allowed to bring enough for the duration of your trip. If you are gone for a week, that is quite a bit of baby food pouches or jars. I recommend the pouches when traveling with a baby. Like breastmilk and formula you will have to separate baby food from the rest of your carry-on luggage and declare it with TSA. They will likely inspect it and possibly open one of the containers. If that happens, plan to use that one first since once opened baby food should be used within a day. Finally, when you travel with breastmilk, food, or formula, plan to pack enough for an extra day or so. Traveling can be unpredictable, flights can get cancelled, you may have an unanticipated long layover, and your trip may end up being longer than expected. So be prepared, and pack accordingly. Have a question or comment about how to travel with breastmilk, formula, or baby food? We’d love to hear from you. Leave us your thoughts in the comments below.